Despite often being treated as an ‘anti-case’ of regionalism, borrowing an expression used for the Middle Eastern region (Coskun, 2008, p. 89), Turkey has recently been receiving considerable amount of public and scholarly attention due to its increasing international profile and active foreign policy over the past decade. It has been called, among other things, a ‘benign’ (instead of a ‘coercive regional power’) (Aras, 2005; Onis, 2003), a ‘trading state’ (Kirisci, 2009), an ‘emerging middle power’, and a ‘bridge-builder’ (Lesage and Kacar, 2010; Vom Hau et al., 2012). However, these analyses have not addressed Turkey’s role (or lack thereof) in facilitating regional governance as defined in this volume. Yet, in the case of Turkey, this is crucial. The latest ‘global’ crisis has had dramatic implications for the European, the Middle Eastern, and Mediterranean regions, all three of which border Turkey. It is thus appropriate to consider the challenges posed to Turkey, given the rhetoric of its so-called emergent regional influence, and to use approaches, which assume the permeation of such influence over time. 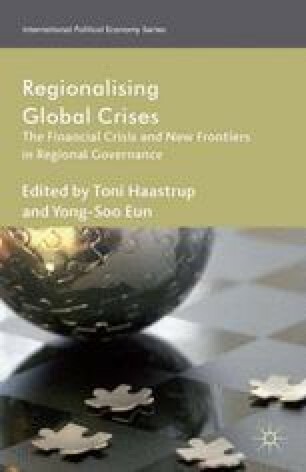 To do this, a critical and historical perspective, which incorporates the decisive role of crisis (in the singular), and crises (in plural), in triggering and hindering regional governance modes is necessary. The author would like to thank the organizers and contributors of the GREEN workshop ‘Global Crises and Regional Governance’ and the editors of this volume for their insightful comments on the earlier versions of this chapter, and acknowledge the support of the Early Career Fellowship of the Institute of Advanced Study at University of Warwick during the process of preparation and presentation of the initial paper.